The Bio-Ultimate® Platinum features the latest in microcurrent technology development, including the patented technological breakthrough Suzuki Sequencing®. This revolutionary system delivers unsurpassed application and performance in less time. The Bio-Ultimate® Platinum System including bT-Ceuticals®, is touted as the single most powerful tool available to the skin therapist today. The Bio-Ultimate® Platinum is completely pre-programmed and easy to use. 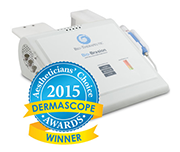 This advanced technology is set to redefine and create a new standard and comfort in microdermabrasion services. The unique technology, combined with its superior designed Diamond tip hand piece, allows the skin therapist to perform the most progressive new service in skin care; layered wet / dry microdermabrasion. 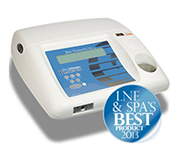 A variety of abrasion selections and Aquafuse products allows the skin therapist to quickly perform as many as four passes, creating a unique and exact service to meet every client's objective. The Bio-Synthesis LED lights ranges from red, yellow, green, blue, and includes a user friendly touch screen control panel with seven preset programs. 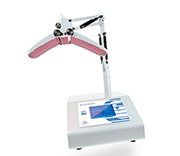 The manual mode allows the skin therapist to quickly create unique services. Applications are convenient and hands free with an intelligently designed 6 way adjustable Synthesis panel, and nearly 3000 individual lights for maximum and consistent coverage.